Gerard G. Dabu is charged with assault and resisting arrest after he allegedly threw an unknown liquid at Mr. Knowles while he gave a speech titled, “Men Are Not Women,” at an event hosted by Young Americans for Freedom, a local CBS affiliate reported. “I believe that gentleman just threw paint on me,” Mr. Knowles is overheard in one video. Mr. Agrawal said in his statement that while Mr. Knowles‘ political views do not align with the university’s “commitment to diversity and inclusion,” the school still has a duty to protect speakers’ First Amendment rights. 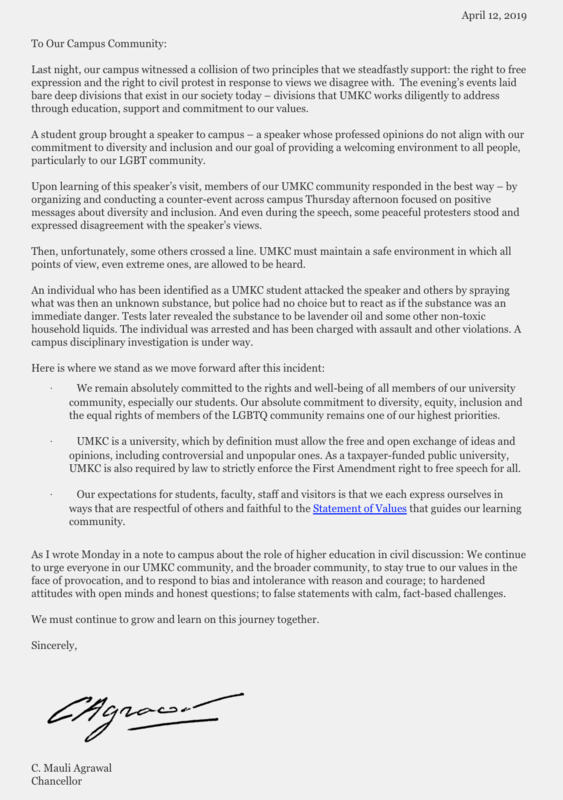 “UMKC must maintain a safe environment in which all points of view, even extreme ones, are allowed to be heard,” he wrote, adding that a campus disciplinary investigation into Mr. Dabu is underway. Mr. Knowles was incensed by the university’s response.